In spring The Roughskin Newt “ Taricha granulosa” migrates from under logs, tree roots and vegetation of their winter homes in the forest to ponds and wetlands. The Taricha (a preserved mummy) granulosa (full of small grains) is getting ready for the breeding season. Like other amphibians they breathe through their skin so they are sensitive to the environment around them. Roughskin Newts are terrestrial and aquatic. They are fairly large for a salamander and grow to about 22 cm from snout to tail tip. Newts have a grainy, pebbly skin, which can be a deep chocolate brown or grey and blend well in the forest. 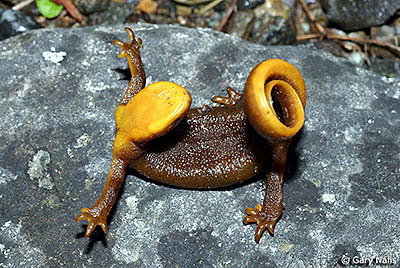 The unique feature of this newt is its underside which is a vivid yellowish orange and for good reason. This is how the newt warns off predators. When threatened the newt arches its head back over its body and curls its tail up over its back thus exposing orange of its underbelly. The Roughskin Newt carries the toxin tetrodotoxcin the same toxin carried by puffer fish and is potentially fatal if ingested. Newts rarely release their poison however just rely on their bright colouring. One predator not deterred by this dramatic display and unaffected by the toxin is the garter snake. In fact studies have found that the more the garter snake preys on the newt, the newt ‘s toxin becomes stronger. of up to 8 or more newts can be seen in ponds at this time. Fertilization takes place when male releases a sperm packet, which the female picks up with her cloaca. The female lays eggs singly (unlike other amphibians which create masses of eggs) encased in protective jelly and hides them under aquatic leaves and stems. Three to four weeks’ later tiny hatchlings emerge resembling tadpoles but have evident frothy ragged gills, which set them apart. In a matter of weeks they advance to the larvae stage and then metamorphose into juveniles resembling their adult parents. At the end of the breeding season the adults and juveniles leave the pond to go back to the forest. The juveniles may not return to the pond to breed for several years instead stay foraging on the forest floor. The newts are carnivorous and feed on a smorgasbord of organisms, mosquito larvae insects, slugs, worms and other amphibian eggs. 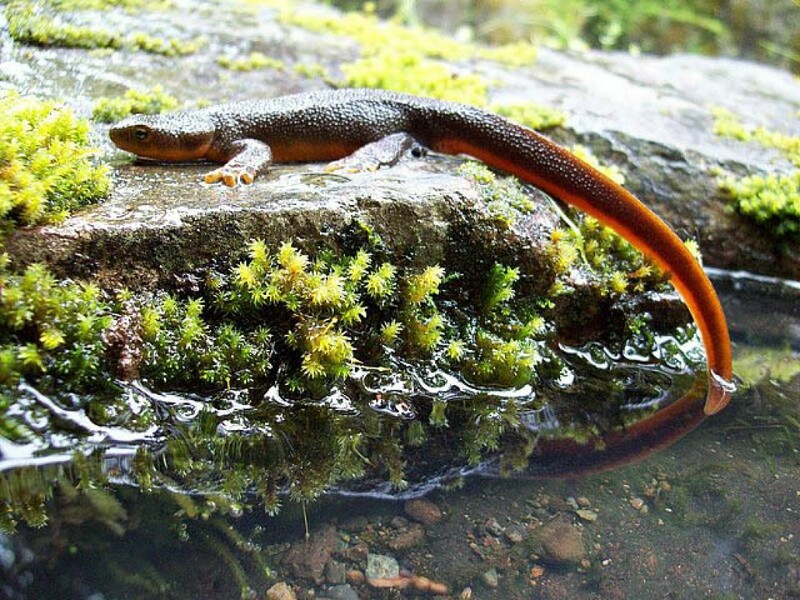 Roughskin Newts range all along the Pacific Northwest coast, which include BC mainland coast, Gulf islands and Vancouver Island. Studies indicate newts can live up to twelve years.